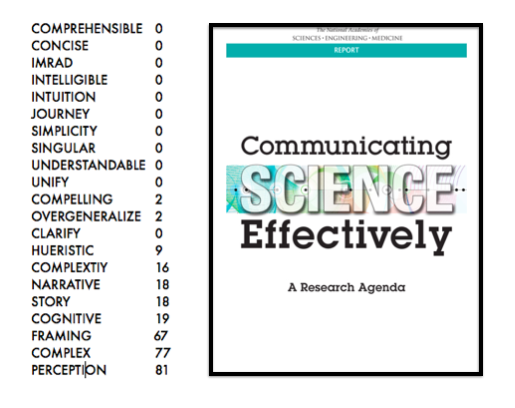 The National Academies of Sciences, Engineering and Medicine just announced they are releasing a report titled, “Communicating Science Effectively.” A quick search of the report for key words reveals a number of biases in the thinking behind it. I’m sorry, but this is a sad case of the blind leading the blind. Truly it is. The numbers say it all. How can you talk about communicating anything effectively and never mention the word SIMPLICITY? Any mathematician, for starters, will tell you the key to solving problems effectively is to find the simple solution. There’s the age old adage that “simplicity is the ultimate sophistication.” And yet here is a report from the National Academies that doesn’t have even a hint of that thinking? How can you talk about communication and not mention the word INTUITION? Communication isn’t something that robots know how to do. It’s done by humans. They draw on intuition when they communicate. Even if they are scientists. Even if they are scientists speaking at the most intense of scientific meetings. I know this, I was a scientist once. There is nothing in this report about the need to find singular, unifying themes, or consider science as a journey. There’s not even a nod to the IMRAD template that lies at the heart of the effective communication for research scientists. This report is so vastly mislabeled. I don’t want to ridicule it, I just want readers to know that as the science community complains about not being heard, this is where large amounts of effort are going.